Don't underestimate the power of developing a positive mindset. It is definitely not about being pollyannaerish (is that a word? and ignoring problems. It is not about sitting in the park under a tree chanting ohhmmmm and hoping for the best! Thinking positively means you acknowledge reality BUT then you turn your undivided attention to where you are heading ... consistently focusing on feeling good about where you are AND feeling excitement about where you are going. If you are thinking, "But I've got to be focused on my problems. I can't just be all positive about the future" you've got the wrong end of the stick. When you are driving and you see a car accident happen just in front of you - do you turn your entire focus on the car accident or do you look for an escape route to ensure you safely navigate your way around the problem? Life is no different. You MUST acknowledge the problem .... you can't ignore a car accident in front of you, however, nor should you give it your undivided attention ... use either of these tactics and you'll plow right through it and create an even bigger problem! As a leader you are responsible for finding problems .... but your bigger obligation is to finding solutions. And that's why you have to master developing a positive mindset. Seriously, do you think you can be at your creative genius when you are negative, pessimistic and disheartened?? That one question there provides you with the clue as to why it is important to get your thinking where it needs to be. Here's quick example of how not developing a positive mindset could limit your career success. Imagine you want to ask for a salary increase. You know that you deserve it - you and your team are delivering great results, you've recently found that you aren't being paid on par with some of your peers and you haven't had an increase for a while. All good reasons to ask for that raise! However, you start to focus on 'reality'. There's a global economic downturn, your boss seems to be having a 'bad hair year', the last guy that asked for an increase got refused and then was fired a month or two later for 'performance issues'. Looking at 'reality' you decide asking for a raise is a waste of time... if not downright risky! But what if instead, you looked at that reality, and then decided to focus on finding a solution to those problems! Maybe you might find solutions like -- Finding ways other groups are recession-proofing their businesses and adopting similar tactics. Asking your boss to consider a bonus/profit sharing scheme. Finding a way to lead your boss to offering a raise without having to ask for it. When you give more focus to solutions, than the problems, you are more likely to get the results you want. Focusing on the problems ... you are more likely to give up and move into a spiral of helplessness. There's a very powerful model that I use when I'm coaching and when I'm just getting 'stuff' done. It's called Solutions Focused Coaching. This coaching model uses people's positive mindset to help them keep moving around challenges that are getting in their way of success. 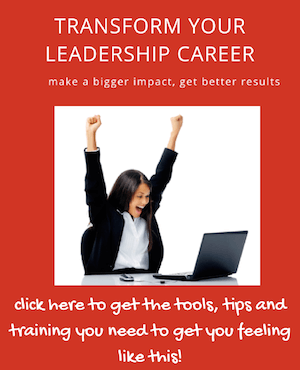 Check it out it's well worth putting in your leadership arsenal of tools! "Worry is negative goal setting"
Make use of this very powerful statement to improve your life! Think about this for a moment, if your leader got up and said something along the lines of, "We've got this goal to achieve, and here are all the obstacles to overcome and I'm not sure if we can get around them, but I guess we can have a go". You wouldn't be all that fired up would you? Contrast that with a leader who says something like, "We've got this goal to achieve, and there are the obstacles, It will be challenging, but let's start brainstorming some solutions now and also keep our eye open over the next few days and weeks for ways that we can win. We are a bright, talented bunch of people and I know we have it within us to work our way around these problems". Same scenario. Different expectation. If I wanted to make a positive dent in the universe, I'd rather have Tigger than Eeyore in my network! Developing a positive mindset has a favorable impact on the people with whom you are in some kind of relationship - be it business, dating or marriage. Thinking negatively, will run counter to your desire to have quality time, and experiences, with those people you care about and want the best for. Negative thinking creates self-doubt and insecurity which leads to diminished self worth .. and this leads to fractured relationships... because people who don't feel good (in other words have low self-esteem) try to bring those around them down to their level - so they can feel better. Read more about self-esteem. Who do you know who is generally a positive person? How do you feel after you have spent some time with them? Contrast that with a person who is more a doomer and gloomer - how do you feel after you have spent time with them? Talking with your manager in a calm, confident manner about the value you are bringing to the organization and why an increase in your salary is justified. Visualizing is about preparing yourself to perform at your best form ... getting your mental attitude in proper perspective and moving toward what you want - rather than focusing on what you don't want. Do this well, and you will find life flows better and you feel frisky, alive, engaged and overflowing with confidence. and I can guarantee that you will naturally become a hub that people will be drawn to ... simply because you feel good to be around. The best part about developing a positive mindset? You will really like you ... your self-esteem will soar ... and it becomes a self-perpetuating cycle of success.